The right colors, ratio and national arms (seal), in an "html" version of the Guatemalan flag, can be seen at www.quetzalnet.com. As far as I know, Guatemala follows a practice common to several other nations (Germany and Austria are examples) of having two official flags for use at land: the one known as civil flag is the blue-white-blue with no further ornaments, to be used primarily by the citizens, and the one known as state flag, which adds the coat of arms to the civil flag. Usually, this flag is to be used in any official condition to represent the country, though the specifics of it's usage varies from country to country. From the number of messages we've been receiving saying that the blue-white-blue flag is wrong, it looks like in Guatemala the state flag is much more in use than the civil flag, or even that the civil flag is not used at all. An anecdote we were told in primary school regarding the position of the colors in the Guatemalan and Central American flags said that the blue stripes with the white in between symbolized the land between the two seas. The Pantone value for the shade of blue in the flag of Guatemala would be 297, but Luis Havas mentions 2995. - National Flag (-CS/-CS (5:8)) - BWB vertical tricolour with coat of arms in the middle. The colour approximation given in Album 2000 is Pantone 299c, i.e. CMYK 90-20-0-0. RGB this would be something like 0-102-255. - Civil Flag and Ensign (C--/C-- (5:8)) - BWB vertical triband. An article (only in Spanish) about the topic: "Guatemala's color of the flag", can be read in www.lahora.com.gt. Translated from this article: "According to a directive of Arzz, the color is "sky blue". Although the national flag is made and distributed in different shades of blue, officially the color established by this is that called "sky blue", according to the directive issued in 1997." This is Decree No. 104 of 26 September 1997 which confirmed the colours as blue ISSWC-NBS 177 and white ISCC-NBS 263 in the (US) Inter-Society Council and National Bureau of Standards range. These same colours were also given in a Presidential Decree of 12 September 1968, so I don't quite understand how they could only have been "established" in 1997. The question put by the article is (if I have it translated correctly): "is the flag (dark) blue or sky blue"? and the answer appears to be that it should be "sky blue". I couldn't find anything (colour-wise that is) on the 1968 Decree. It does, however, quote the ISCC colours I gave above. The answer in the article (of the flag of Guatemala) is that its correct color is sky blue. However, according to the same article, in a poll people answered that the "correct" color was dark blue. Some historians' conclusion is that there is some kind of lack of knowledge of the subject between people. The color is sky blue. I think that ISCC-NBS 177 color is close (not exactly, but close) to a Pantone 297 or a Pantone 298 (Pantone 298 was recommended for the National Flag of Argentina some years ago for the Academia Nacional de la Historia, so the Guatemalan color is very close to the Argentine one). For Guatemala: PMS 299 blue, 355 green, 032 red, 125 yellow, 109 yellow, 497 brown, 430 grey and black. The vertical flag is simply the horizontal version turned 90 degrees clockwise. In "Flags and South Africa and the World", Proceedings of the XVIIth International Congress of Vexillology, there is a paper by Teodoro Amerlinck entitled: "Histoires des insignes du Guatemala" (A history of Guatemalan emblems); (pp. 127-135. 1. The national colours shall be blue and white in three vertical stripes, with the white stripe in the middle. 2. The national ensign shall include in the white stripe the shield of arms of the Republic. 3. The civil ensign shall be the same, but without the shield. 4. The cockade shall have the same colours in the same pattern. A shield with two rifles and two golden swords tied with laurel branches, on a light blue field. The center shall be masked by a parchment, on which golden letters shall read "Libertad 15 de Septiembre de 1821". Above, there shall be a Quetzal (Pharomacrus Mocinno) as the symbol of Independence and autonomy of the Nation. The Constitutional President of the Republic. Considering: That, according the decrees 12 and 33, dated 13 August [12 August according to Decree reported above] and 18 November 1871, respectively and signed by the President of Guatemala, General Miguel Garcia Granados, the national flag and the shield of the Republic were established. Considering: That the lack of appropriate regulation on such an important question caused the symbols of the country to be represented in a whimsical and arbitrary manner, regarding both the colour shades and the drawing of the shield of arms of the Republic. Considering: That by Governmental Agreement of 30 November 1967, a commission was created to realize the studies necessary to the correct enforcement of the laws, and after worthy work, gave its decision. Article 1. The flag of Guatemala is the supreme emblem of the Nation. It bears in the centre the shield of Arms of the Republic, according to the Decrees 12 and 33 of 17 August [13 August in the same text, see above] and 18 November 1871, respectively. Article 2. The flag shall not bear any caption or additional lettering, except in specific cases in accordance with military regulations. Article 4. The shape of the flag is a rectangle with proportions of 5:8, vertical and horizontal, respectively. The relation 5 to 8 matches the golden rule of aesthetical proportion. Article 6. The genuine Remington rifles (1871) shall be shown with triangular bayonet, in side view with the "pontet" [the metallic piece that protects the trigger] down, and crossed at right angle in the centre of the shield. Article 7. The swords, symbols of justice and sovereignty, without scabbard and in gold, are crossed at right angle, in symmetry with the rifles. Article 8. The laurel branches, symbol of victory, which interlace the arms, are represented in natural with their fruit, with their bases interlaced and without tie. The lower leaves of the branches shall interlace with the hilts of the swords, and the uppermost leaves shall interlace with the bayonets. Article 9. The parchment, whose caption immortalizes the birth date of the country, unrolls on the centre of the shield, on the rifle crossing. It rolls a revolution and a half to the obverse of the upper part and a revolution and a half to the reverse in the lower part, and stands on the blades of the swords. In the centre of the parchment shall be read in capital letters, on four lines, the following: on the first line LIBERTAD, on the second 15 DE, on the third SETIEMBRE and on the fourth DE 1821. Article 10. On the top of the parchment stands a quetzal, the supreme symbol of liberty. It is shown dexter with natural colours. The feather tails lay on the corresponding side [unclear in the original French text] and shall surpass [?] slightly the lower leaves of the laurel. The next articles regulate the use of the flag and shield. Article 14 states that nomenclature follows the ISCC (International Society of Colour Council) and NBS (National Bureau of Standards, USA) or the International Color Coding System of Munsell Color Company (VM). Article 17 states that the regulation will be enforced on 15 September of the present year , the Nation's Day. The author notes that several minor variations in the shield are common, especially in the Quetzal design, the shape of the parchment, the letterings SETIEMBRE or SEPTIEMBRE and the laurels, which often look like coffee trees. The book "Historial de las Insignias de Guatemala Sociadad de Geografia e Historia" (Guatemala 1971) gives the date and text of the decree. The blue-white-blue vertical flag is adopt at 17. Aug.1871. The coat of arms was adopted on 18 Nov. 1871. At "Nouveau Petit Larousse Illustre" (1926), Guatemala Flag probably got the same badge, but around it a shield shape, if I'm not mistaken quite similar to the shape around the Route numbers in the USA. According to old European sources, Guatemala state flag in 1879 and 1882 (and 1898 at Japanese flag book too) is royal blue, white ,royal blue vertical 3 stripes (1:1:1) with Arms in yellow bordered royal blue shield in white stripe. proportion 1:2 and 5:8. We assume that the images sent by Nozomi Kariyasu are wrong reconstructions. The image of Guatemalan flag drawn by Jaume Olle is based on source from Flags of Maritime Nations by U.S, dept of Navy 1882, similar image from Japanese book Kakkoku Kisho Meikan by Yosei Michimoto 1898 and British book Flags of All Nations 1879. 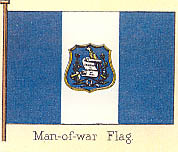 Flaggenbuch by German Navy in 1905 shows Guatemalan state flag with Coat of Arms in shield as well.